Two speakers -- one an executive with the NFL’s Baltimore Ravens, the other the chief executive officer of Blue Cross Blue Shield of Wyoming -- will discuss their respective business careers with University of Wyoming Master of Business Administration (MBA) Program students Friday, Nov. 10. Kevin Rochlitz, a Powell native and UW College of Business marketing graduate, is the Baltimore Ravens’ senior vice president of corporate sales and business development. He will speak to MBA students at 8:30 a.m. in the College of Business boardroom. He will share his expertise in the day-to-day operations and management of a professional sports team. 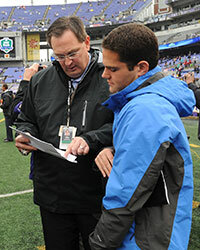 After joining the Baltimore Ravens in 2003, Rochlitz worked his way up the ladder and was later promoted to his current position with the club. He was an executive when the Ravens won Super Bowl XLVII in 2013 over the San Francisco 49ers. Rochlitz leads the Ravens’ corporate sales department and has completed numerous contracts and partnerships with top corporations. He received recognition for his outstanding performance, including being named Baltimore Smart CEO Executive of the Year in 2016 and being chosen to participate in the Leadership Baltimore County program from 2015-16. He also is a member of the UW College of Business Advisory Board. Following Rochlitz’s talk, Rick Schum will discuss his 35-year career in the health insurance industry from 10:30 a.m.-noon. He is the CEO of Blue Cross Blue Shield of Wyoming and a member of multiple organizations, including the National Association of Insurance and Financial Advisors, and the Wyoming Association of Independent Agents. He also serves on a number of boards, including the Blue Cross Blue Shield Association Board; the FEP Board of Managers; is chairman of the National Employee Benefit Committee; and serves on the boards of Prime Therapeutics and TriWest Health Care Alliance. He has a business management degree (1981) from UW. The Executive MBA Series this fall allows UW MBA students the opportunity to participate in roundtable discussions and receive real-world learning experiences from a group of diverse industry leaders, including Gov. Matt Mead, Secretary of State Ed Murray, energy CEOs, entrepreneurs, venture capitalists, financial service representatives and sports industry executives. The UW MBA Program is currently accepting applications for the 2018 fall semester and will admit qualified students on a rolling basis until the cohort group is filled or June 30, whichever comes first, says Tanner Parmely, MBA Program coordinator. For more information, call Parmely at (307) 766-2449 or email tparmely@uwyo.edu.